The Most Reverend Maurice F. McAuliffe, D.D., Bishop of the Hartford Diocese, saw the need to establish a new parish in the Prospect Beach section of West Haven. In 1935 he appointed Rev. John Walsh as the first pastor of Our Lady of Victory Parish. With boundless energy, Father Walsh set about establishing Our Lady of Victory. In October of 1935, when he purchased the Colonial Inn on Ocean Avenue, there were 220 families in the parish. The men of the parish assisted in the renovation of the Inn making it resemble a Church as much as possible. The first Mass must have been a strange scene...a close-knit group of worshippers that gathered together in what had been a well-known place of entertainment now gathered to pray. Instead of pews, there were chairs and kneelers, and many of the decorations and statues were either hand-me-downs or borrowed from other parishes. But the people banded together to make this parish work and with their efforts its membership increased. The strength of the Parish was certainly not financial. After the purchase of the Inn, the rectory had to be renovated and completely furnished. This took several months and thousands of dollars. When Father Walsh moved into the rectory in February 1936, the parish was forty thousand dollars in debt, quite a sizable sum in those days. The true strength of the parish was in its Pastor and its people. The ladies of the parish banded together into a Guild, a core of loyal women willing to sacrifice their time and talent to make this parish a whole unit, one in spirit and faith. The first Easter sale and carnival was held in 1936 and, as today, remains a great source of financial revenues, as well as a community building event. The parish was small, but the spirit was tremendous. Five Sisters of Mercy from Sacred Heart in New Haven came every week to instruct the children of the parish, until 1946 when the Ursuline Sisters of Tildock joined the parish. The Ursuline Sisters still serve our parish today, not only in the school, but also in our social ministries. The parish continued to grow. In the summer of 1936, a fourth Mass had to be added to accommodate the growing number of parishioners and, in the very next year, a fifth Mass was added to the weekend schedule. It was a tribute to the hard work and dedication of the founding members of this parish. Our Lady of Victory also grew financially more stable. By the year 1941, the original debt of forty thousand dollars had been paid off. This shows the determination and faith of all those people who came before us. Rev. Timothy Byrne replaced Father Walsh in 1946. He, too, was enthusiastic and worked hard to make Our Lady of Victory a strong and viable parish. He initiated a nursery school, which was to be the basis of a future parochial school. It was his intention to add a grade each year. His first graduating kindergarten class had 40 students. Father John Hurley was appointed by the Archdiocese to Our Lady of Victory in 1947. The addition of the assistant made it possible to increase involvement with the young people of the parish, especially those in high school. In 1947 Father Byrne was assigned to St. Paul�s Parish in West Haven and Father Walsh returned to the parish he had started. Father Walsh and Father Hurley worked tirelessly. Under their leadership the parish grew spiritually, financially and physically. In June 1954, Father Thomas McMahon arrived at Our Lady of Victory as Pastor. He realized that the parish had outgrown itself and received permission from the Most Reverend Henry J. O�Brien, D.D. to purchase ten acres of land on Jones Hill Road, the site of our present church. 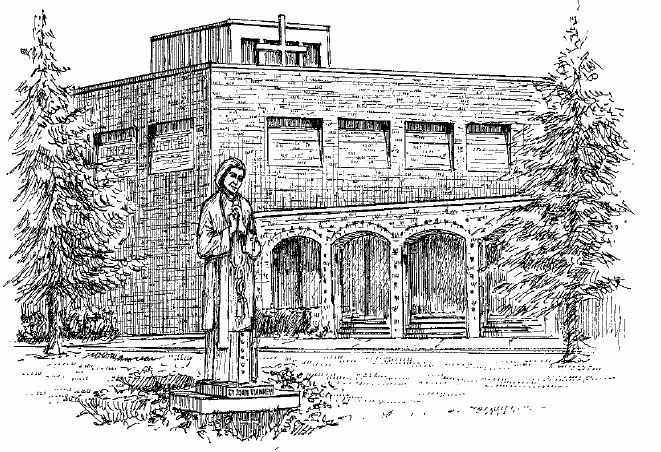 Father McMahon established a Building Fund Campaign to obtain funds to purchase the property and build a new Church. A goal of two hundred thousand dollars was set. The campaign ran from February through April of 1955 and the support of every family in the parish was solicited. Our current church is a testament to the success of the campaign and the marvelous cooperation of our parishioners, who gave so freely. Ground was broken for the new parish buildings on July 24, 1955. The growth of the parish was, again, tremendous. Masses were added and catechumenial classes were held for our children at Seth G. Haley School. In 1959 the need for another assistant became evident and Father Ernest Coppa (6-4-1955) joined Father James Glynn, who had replaced Father Hurley in 1954. Our parish continued to flourish. As the area around the Church began to develop, the number of parishioners kept growing. Many new priests were assigned to Our Lady of Victory to minister to our people. They were Reverends Thomas E. Berberich, James O. Lambert, Norman J. Belval, Richard P. McBrien, James B. Gunnoud, Joseph E. Vujs, Anthony J. Bruno, Mark F. Flynn, H. Maynard Kearns, Robert L. Callahan and Robert G. Ladamus. In the early 1980�s, with the arrival of the parochial team of Reverends Francis T. Butler, Dominic J. Valla and Alphonse P. Zarrella, plans were begun to do major renovations to the Church. The sanctuary area, which was at the end of a long aisle, was moved to the center of the Church where it could be viewed clearly by all in the congregation. The work was completed in time to celebrate the 40th anniversary of the parish in 1985. The school, too, grew. It went from being a Junior High School to a grammar school, Kindergarten through Eighth Grade. Enrollment was not a problem, as many in the community wanted a Catholic education for their children. A preschool program was also established having both morning and afternoon sessions. Our kindergarten classes are all day sessions, rather than just morning and afternoon classes. An after school program, Project Love, was also established providing both assistance with learning and fun projects for those who attend. The 1980�s and 1990�s brought new priests to serve us, Reverends John F. Brinsmade, Joseph J. Dawaele, CICM, Gary F. Simone, Mark S. Suslenko, John F. Curran, Matthew Kappalumakkel and Greg Altermatt. Under the direction of the Reverend Mark S. Suslenko, the 1990�s brought other changes to the parish. With the number of religious vocations decreasing and meeting space being at a premium, it was decided that the convent space could be better utilized. There also were some safety concerns that had not been addressed. The first floor of the convent was converted into the Parish Center with several meeting rooms and an office for the Pastoral Minister. Also, the Nursery School, which was housed in the basement, was brought up to the first floor and the former Nursery School space became home to the Social Ministry�s Clothes Closet. The second floor was remodeled to make more comfortable living arrangements for our parish Sisters. A beautiful chapel, which houses the Blessed Sacrament, was made on the third floor providing a warm place for meditation. Also in 1998, the church underwent additional renovations. The altar was raised and brought forward, the tabernacle was moved to the sanctuary, the Baptismal font was moved for greater visibility, and a ramp installed to afford access to all people into the sanctuary. The organ and piano were moved to enhance the sound of the music and choir. One of the most significant additions made during these renovations was an inspiring sculpture depicting the Holy Family. Its unique concept offers all of us a meditative perspective on the meaning of the Holy Family in our lives. A rededication of the Church was held on May 24, 1998. One of the most major events in the history of the parish came in 2002 with the linking of Our Lady of Victory with St. John Vianney Parish on Captain Thomas Blvd. in West Haven. The two now share personnel and resources and have grown close with many joint events and cooperation. From 2003 to 2006 the Reverend Christopher Tiano served as Pastor with assistant Rev. Joseph Cronin Parochial Vicar joining him. The Reverend Greg Altermatt continued to assist at Mass. Sister Ellen McNaulty Pastoral Associate also joined the parish family. Many events and changes marked Father Tiano�s tenure, the including increased food drives, expanding ministries and an all day youth rally held on the grounds of St. John Vianney on May 7, 2006. The Youth Rally was a joint parish community effort which was capped off with a Mass celebrated by ArchBishop Mansel. Tiano was transferred in 2006 and Father Cronin took over as the Parish Administrator. The Rev. Richard Okiria joined us as Parochial Vicar. The Convent has been renamed �the Beacon on the Hill� and now houses the Clothes Closet, a diaper bank, a food pantry and the rooms upstairs are occupied by two sisters. As a result of the Archdiocese of Hartford Pastoral Planning during 2016 & 2017, as of June 29, 2017, Father Kevin M. Dillon became pastor of Our Lady of Victory Parish and St. John Vianney parish merged with Our Lady of Victory to form one parish.